Buy Eternity LVT SG Underlayment & Save 30-60%! Rated among the highest in the flooring industry with acoustic ratings of STC72/IIC73/Delta IIC21! 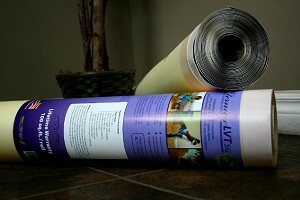 Eternity was created to be an advanced acoustic barrier for vinyl flooring. Containing no Volatile Organic Compounds means that Eternity Foam is the first and only ZeroVOC underlayment on the market. This new technology provides zero harmful emissions and exceeds all standards for indoor air quality including the California protocol. V.O.C. BLOCKER TM additionally protects your family from harmful sub-floor emissions by blocking their direct transmission into the room. !! !LIFETIME WARRANTY!!! For Residential and Commercial Floating LVT applications. Seal Guard Seaming System for easy installation. Excellent for radiant heat floors.